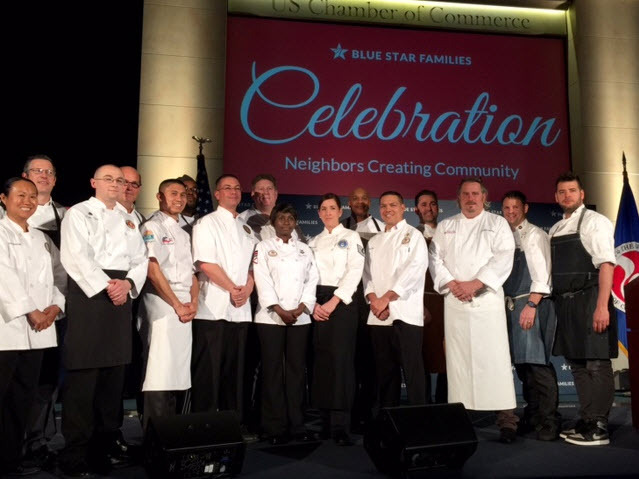 Chefs from some of our area’s leading restaurants participated in a fundraiser last week for Blue Star Families, pairing up with military chef counterparts to prepare some scrumptious nibbles and sips. With a view of the White House across Lafayette Park as backdrop, guests were treated to an array of fabulous food. The splashy red carpet event was filled to capacity with the extraordinary Americans who donate their time to support military families. Guests recorded the moment in selfie photo booths, using patriotic-colored bead necklaces to place around the necks of the chefs whose dishes they liked most. Just to give you a little background on this amazing organization, there are over 50 chapters around the world serving military families and providing assistance through education, empowerment and employment programs in civilian communities. Chapters partner with the general public and other services to address the challenges of military life and reach over 1.5 million military families every year. Can I get a hooray? Hosted by Co-Chairs Sheila Casey and General George Casey, prominent members of the organization along with high-level military and politicians and their families, gathered in the grand reception room of the U. S. Chamber of Commerce for the celebration. The evening’s emcee, author, TV and radio host and speaker, Mary Matalin, joined in the tastings before the ceremony began. 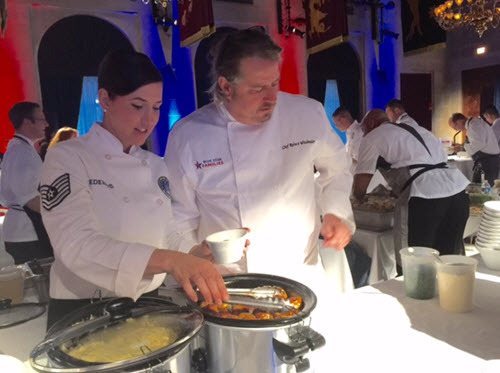 Partnering with and representing the Air Force was TSGT Jennifer Medeiros who created a dish with Robert Wiedmaier of Marcel’s restaurant. Wiedmaier’s father was a “Full Bird” Colonel in the U. S. Air Force. Together they served up Chicken and Pheasant Meatballs with Creamy Polenta and Tomato Red Wine Sauce. 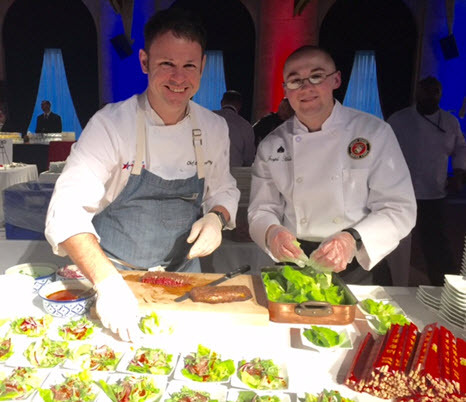 Representing the Marine Corps was Cathal Armstrong of Restaurant Eve, named a “Champion of Change” by the White House, who partnered with Marine Sgt. 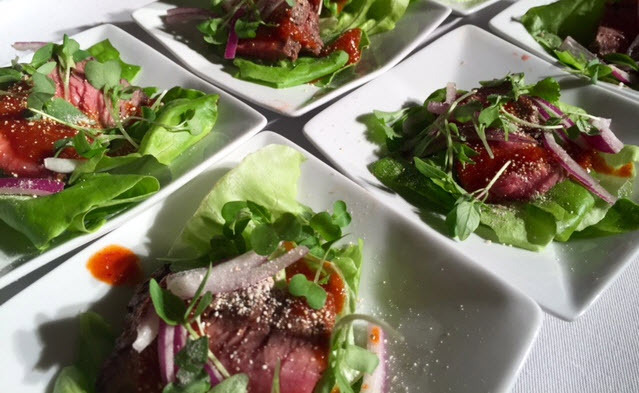 Joseph Hale to prepare Northern Thai Flank Steak Salad reflecting his recent attention to Asian cuisine. Representing the Navy was Derrick Davenport who paired up with David Guas of Bayou Bakery. When asked where he worked, Davenport hinted he didn’t have far to walk from his current employment, but couldn’t say more. Hmmmm. Could it be the White House? 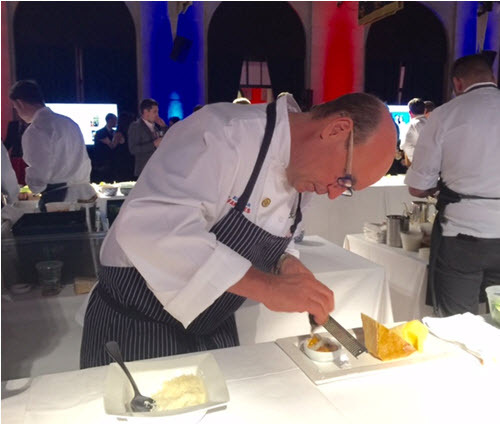 Davenport, who cooked on a submarine for six years before transitioning to the Executive Dining Room of the Joint Chiefs of Staff, is the 2015 American Culinary Federation USA Chef of the Year and as Team Captain for the U. S. Army Culinary Arts Team will compete at the IKA Culinary Olympics in Germany this year. 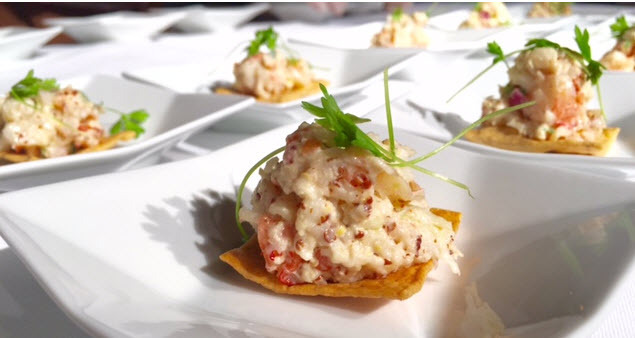 The dynamic duo made a dish of Gulf Stream Shrimp Maison to reflect Guas’ New Orleans’ roots. 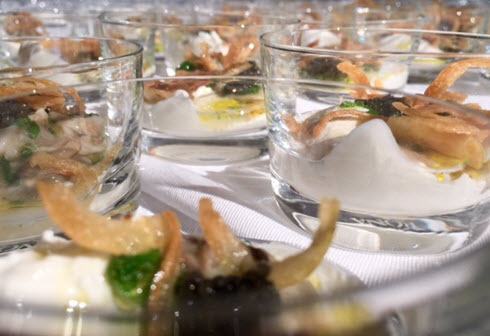 Showing off his skills as a representative of the Army was SSG Marc Susa who along with Todd Gray of Equinox restaurant conjured up Rigatoni with Cannellini Beans, a Smoked Mushroom Bolognese, and topped it off with fermented black radish. 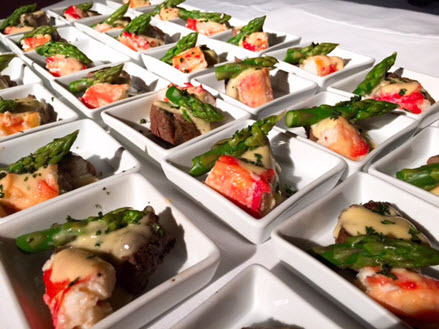 In the Guard + Reserve category were MSG Vilaykone Saynorath, Army, and Chris Morris of Joe’s Seafood, Prime Steak & Stone Crab whose dish precisely represented the restaurant’s luxury ingredients of Beef Filet with Alaskan King Crab with a soupcon of bearnaise sauce. There was even a category for Military Brat that paired Chris Clime of PassionFish with CS1 Frida Karani, Navy. 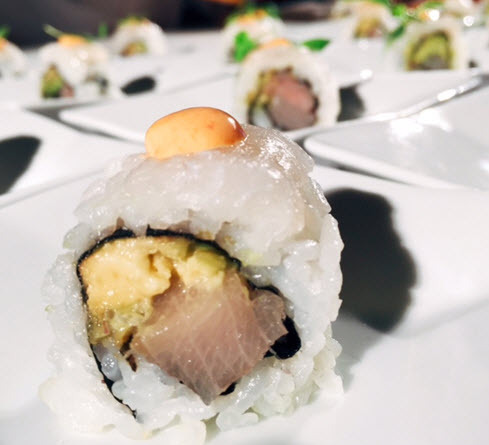 Together they presented Frida’s Freedom Macchu Picchu Roll made with flounder, kampachi, chipotle and lime. 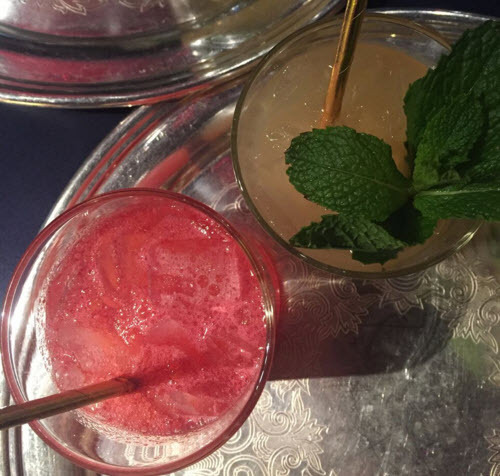 Gina Chersevani, of Buffalo & Bergen and Suburbia, who calls herself a “Mixtress”, crafted killer cocktails for the special occasion, titling them “Love Thy Neighbor” and “We Are Family”. To echo that sentiment and cap off the evening’s award ceremony, Sister Sledge sang her chart-topper, “We Are Family” to the assembled guests. Awards were presented for Civil Leadership to Senator Barbara Boxer and Senator Richard Burr; as well as Congresswoman Cathy McMorris Rodgers and Congressman Sanford D. Bishop, Jr. Dr. Peter Long, PhD, President and CEO of Blue Shield of California Foundation, received The Connie Milstein Philanthropic Award and Joy Goulette accepted The Blue Star Neighbor Award.